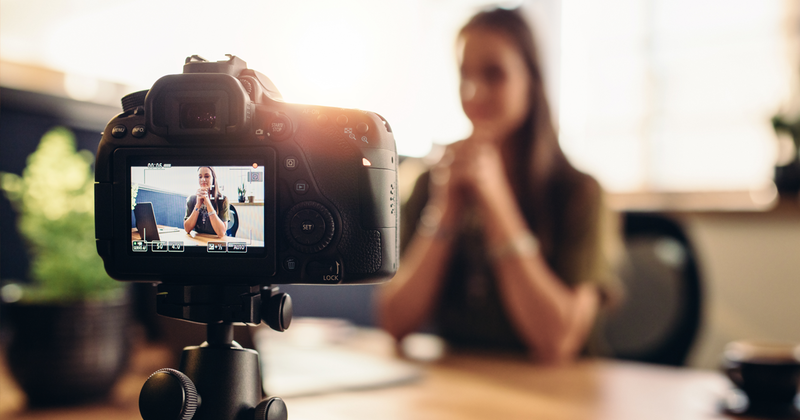 How can video help you connect with and inspire your audience? Video’s power to forge a personal connection with viewers can be remarkable in its effectiveness. The medium offers huge potential to break down barriers between you and your audience quickly and efficiently. Video can help you share your authentic self so people feel like they know you and have a connection to you. Without doubt, face-to- face communication is the most effective means of reaching people. Research shows that face-to- face requests are 34 times more effective than emailed ones. But what if it’s just not possible for you to reach everyone on your in person? This is a common dilemma. Your audience might be too big to fit in a room! When in-person communication isn’t an option you need to use the next best forum. In today’s world, that means connecting through video. According to Cisco, 82% of all Internet traffic will be video by 2021, up from 73% in 2016. Learning to communicate effectively on camera is no longer an option. • Video stirs emotion. Connections most often start in the heart, not the head.Video captures both the heart and soul by bridging the logical and emotional sides of the brain. It sets the stage for a conversation about big ideas and can frame a way of thinking about an issue better than almost any other medium.It sets the tone for an event and sparks conversation. • Video ensures consistency in the delivery of your message. If used correctly, videos are the best guarantee that the message you intend to send to your audience is the one they take away. There’s no “off” day. • Video combines all the key ingredients of human storytelling. Imagery, sound, motion and content are all combined into a single medium. Video represents the Holy Grail that enables you to deliver a compelling, informative story in one desired format. It’s addictive! That’s why we have phrases like “binge watching” in the public lexicon. The best way to inspire your audience is to be real. I spoke with Bernd Beetz, retired CEO of Coty, Inc., who was responsible for reviving the company’s image through its “Faster, Further, Freer” culture. Beetz grew Coty into the largest fragrance company in the world during his ten years there. He knows a thing or two about running a successful company, and among his success secrets was a dedication to video. On the other hand, I know telling you to ‘just be yourself’ won’t quite help. It takes the right communication style, practice, and a good relationship with your director. But even with all that, you’ll never feel comfortable on-camera if you try to be anyone other than yourself. The best and quickest way to make a connection with your audience is to show how a vulnerable moment helped you grow. Consider sharing an experience that shaped who you are today. PepsiCo CEO Indra Nooyi did this when she shared the backstory of her first U.S. job interview. She recounts that when she’d just arrived from India to study at Yale, the only clothes she owned were saris and jeans. Neither would work for a job interview. So she took all the money she had—$50—and bought an interview outfit at her local Kmart. The one problem: she ran out of money for shoes. She paired her bright blue polyester pantsuit with orange snow boots and walked proudly into the interview. She could feel the other students laughing at her. No matter. She held her head up high and conducted the interview. And she got the job. Nooyi balances this story with a glimpse into her work ethic during her rise up the corporate ladder. “I’ve always focused on doing a damn good job, and just hoping the rest takes care of itself,” she said. By sharing this truth, she transforms herself from an untouchable CEO to a flawed, vulnerable (but still powerful) human. There’s a big misconception that great videos require a slick performance. It’s a reason so many excellent leaders shy away from video: they don’t want to be someone they’re not. Just remember that nobody wants a charlatan. Your tribe wants to see you for who you really are. If you’re imperfect on-screen they’re bound to like you more as your humanity shines through. All you need to start is a little time and space to figure out what works best for the real you. As the Founder, CEO, and Creative Director of Tribe Pictures, Vern Oakley has produced and directed films that drive high performance culture for the Global 1000 for over 30 years. He’s the author of the new book Leadership in Focus: Bringing Out Your Best On Camera, which helps business leaders convey their authenticity on camera.